SHETLAND Islands Council is looking to reconfigure some parts of its 8 North Ness headquarters – including revamping its reception area – before moving all of its staff back into the building. Chief executive Maggie Sandison said the local authority wants to “make sure we get the building exactly the way we want it when we move back”. The council is also hoping to fix some issues it had in areas like lighting and “hot or cold spots”. 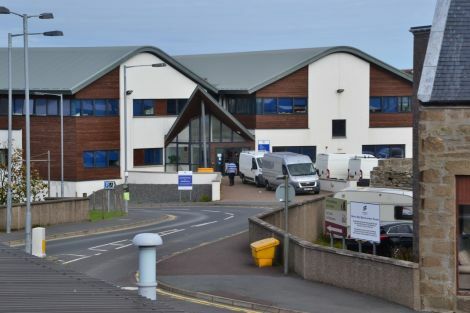 Around 200 workers were evacuated from the £7.3 million building in Lerwick back in 2016 at the request of landlord Shetland Leasing & Property Developments Ltd (SLAP) amid worries about sagging in the floor of the building colloquially known as the White House. However, tests showed there was “no fundamental health and safety issue with the main structure” of the building. The SIC continued to pay rent approaching £500,000 a year to SLAP, which forms part of Shetland Charitable Trust, while the building sat vacant. Sandison told Tuesday’s policy and resources committee that the council is looking to rejig some parts of the building, which opened in 2012, before all staff members move back in. The capital programme team are already back in place at the White House, but a reconfigured reception area is currently being costed as efforts are made to make the entrance more of a public focal point. The make-up of the staff who eventually return to the building, meanwhile, may be different than before. “When we were in there before, there were issues with maybe poor lighting in certain areas, or issues to do with hot spots and cold spots, so one of the things we want to take the opportunity to do as well as the remedial work is to make sure that we get the building exactly the way we want it when we move back,” Sandison said after the meeting. “We want the reception area to be the centre for the public to come to to get all the advice, the support and all the right services in the right building. Sandison said she did not have details on whether any damage which may have been caused to the building during surveying and testing has been rectified. She did, however, say that she believed some remedial work in the building has started to take place – although a full update report should be coming through the council soon. Sandison added that the idea of rejigging the departments which take up residence in the building came after the decanting of staff in 2016 into other council buildings in Lerwick. This placed finance staff alongside housing workers, for example, which Sandison said worked well as it allowed the departments to collaborate more closely together on certain areas, such as benefits. “Some of this is purely responding to the fact that actually some of these ways of working are really good, and we want them to continue when we move back,” she said. A report written by director of corporate services Christine Ferguson presented to the policy and resources committee said that “substantial additional technical and legal resources have been required to safeguard the council’s interests” regarding 8 North Ness. “Work on the contractual issues and plans to return the building to full use will continue to be a feature of the work of corporate services in 2018/19. Meanwhile services continue to operate from a number of locations across Lerwick,” the report added.